Now there’s one good reason to look forward to Weekdays – a 50% off discount at the widespread buffet in Marriott Café! The thought of Monday and hump day has become stressful for some, but having this chance to eat your favourite dishes all you can you might just want to skip the weekends. 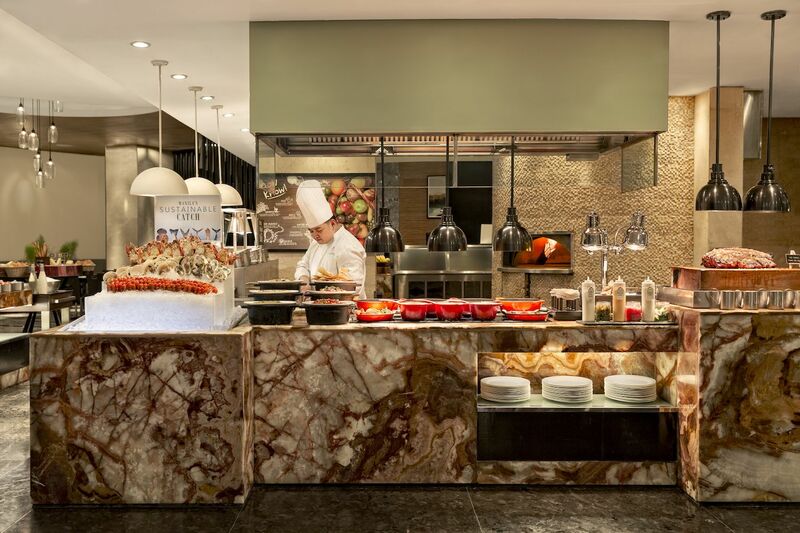 Marriott slices half out of its buffet price from January to February for both lunch and dinner. Such an amazing deal to feast on your favorite dishes until you drop, isn’t? Imagine indulging on wide-varieties of fresh seafood, unlimited slabs of steaks, and dessert selections from baked creations and homemade gelatos. Marriott Café is also best known for its long list of international flavors such as sushi and sashimi bar from Japan, dumplings and roasted meat from China, curried dishes from India, specialty entrees from different Western countries, and of course, the best from Filipino cuisine like kare-kare, bulalo, adobo, modern streetfood and the list goes on. This is also a good start to your week because food are prepared to your satisfaction like that of gambas, pasta, salad and grilled meats. It’s simply saying that you have so much to stuff on your plate/s. So, turn that Manic Monday to a Marriott Monday instead. An awesome buffet treat like this doesn’t happen often, so grab the phone to reserve now.